Bipolar disorder, which used to be called manic depression, is a serious mental health condition that affects between one to three percent of women. If you have already had a diagnosis of bipolar disorder, you are at greater risk of experiencing these symptoms (known as a relapse) of bipolar disorder in the postnatal period. Some women may not have been diagnosed with bipolar disorder in the past, and may experience their first bipolar symptoms (called an episode) for the first time in the postnatal period (the first 12 months after the baby has been born). This is more likely if you have a history of the condition in your family. 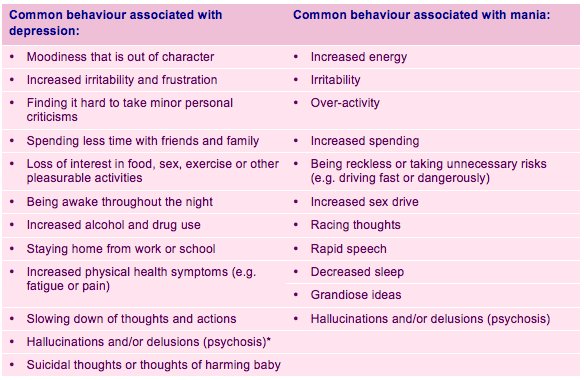 Recognising the signs of bipolar disorder and getting help as early as possible is very important. Sometimes it may be difficult to observe these symptoms in yourself at the time that they start – so both parents learning about the symptoms and knowing what to do is very important for you, your partner, your baby and other children. Bipolar disorder, as the name suggests, involves experiencing quite extreme, opposite symptoms (bipolar) over time. Bipolar disorder can result in periods (called episodes) of depression, which leaves you feeling low and lacking energy, as well as mania (feeling on a high, with elevated mood and lots of energy). Like depression at other times (including during pregnancy or postnatal depression), if you experience bipolar disorder you may find yourself looking at things in a negative way and worry that things are worse than they really are. For example, a women with bipolar disorder who has recently had a baby may worry about whether she is a good mother, whether she deserves to have children or worry a lot about the baby’s health – fearing that something is wrong and needing to constantly take the baby to the doctor for reassurance. At the other end of the spectrum, the periods of mania are likely to give you excessive energy, making you overactive (for example, rushing around, doing lots of activity). You may strong feelings of confidence and self-worth that are out of character and/or believe that ‘you can do anything’. High energy levels also mean that you don’t sleep much, or even feel the need for sleep – even with a new baby. Women may also behave in a way that is unusual, like speaking and/or thinking very quickly (racing thoughts). In some cases, behaviours like being unusually flamboyant or going out on spending sprees can also be associated with the mania side of bipolar disorder. Paranoia – feeling that everyone is against you. These and various other symptoms of depression and mania are outlined below. Whether a woman is experiencing the symptoms of depression or mania, it is very important to seek help as early as possible. Often the women will not recognise the symptoms in herself, so partners and family members play a critical role in observing changes in character and taking the lead to ensure she gets help early. Bipolar disorder significantly impacts on a woman’s ability to care for her baby. She may also be at risk of suicide or harming herself or the baby – so urgent assistance from your general practitioner, mental health service or a hospital emergency department is recommended. Seeking help as early as possible can ensure the mother is safe, so that steps can be made to ensure she receives effective treatment for bipolar disorder as soon as possible.